The jacket has an overlapping, mock turtle neck with two hidden button closures on a velveteen collar. 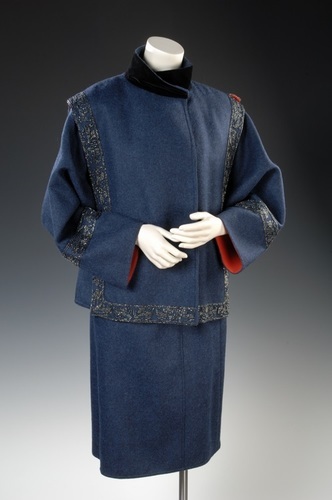 Full raglan sleeves and an attached square panelled cape. There is beading all along the front. The skirt has a side front hook and zipper closure. The suit is marine blue and the jacket is lined with red silk while the skirt is lined with blue silk. There is a short slit in the front of the skirt. .Tag reads "Made in France for Bergdorf Goodman" as well as "Chloe."